Ghanaian President, Nana Akufo-Addo visited Nigeria today. He was received by acting President Yemi Osinbajo, at the Presidential villa, Abuja. 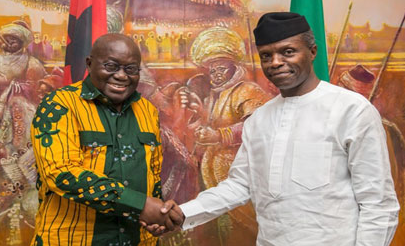 Akufo-Addo arrived at the Villa at about 11.12 a.m. and was welcomed by Osinbajo who ushered him into the Acting President’s office through a red carpet. The visit lasted for barely four minutes as the Ghanaian leader proceeded immediately to the National Defence College to deliver a lecture to the college graduands. Akufo-Addo won the country’s 2016 presidential poll against the incumbent, John Mahama, by a margin of 9.45 per cent. He was inaugurated into office on Jan. 7, 2017.